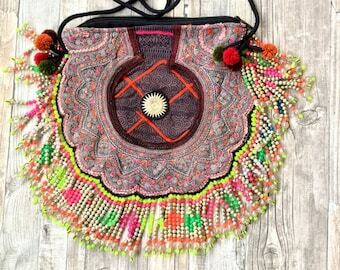 This stunning bag is handmade from beautiful vintage embroidery Banjara fabrics and leather by Banjara women in India. Combined with Suede leather. 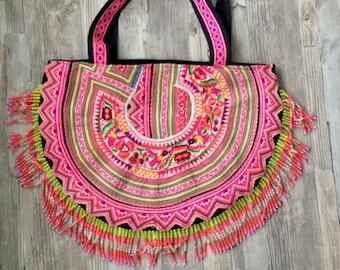 This handmade and unique Banjara bag is fringed and has a beaded badge on the front. 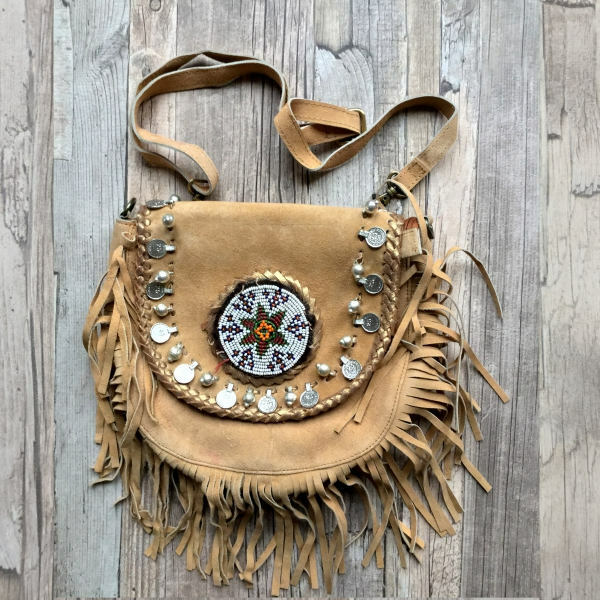 You can wear this bag cross-body and is perfect for festivals, a night out or traveling. 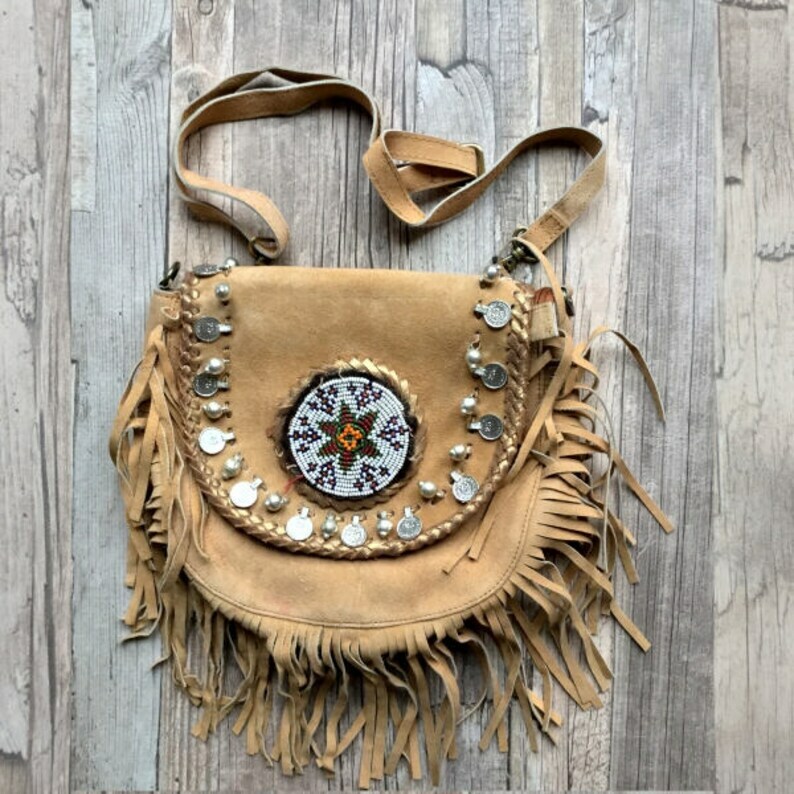 This bag is OOAK, One Of A Kind. 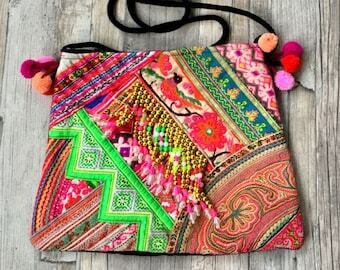 The fabric used for these bags are real vintage fabrics with embroideries. Please keep this in mind before your purchase. 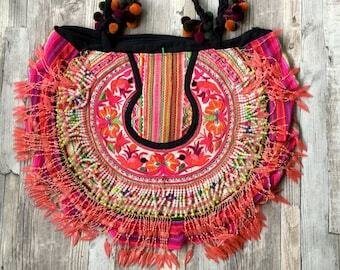 Banjara Embroidery and Needle work has been derived from gypsies and nomads of Andhra Pradesh. 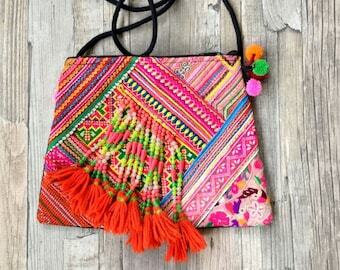 Colorful, vibrant and live are the words synonymous with this embroidery. The colorful lifestyle of Banjaras residing in this state is displayed through their high-spirited clothes. 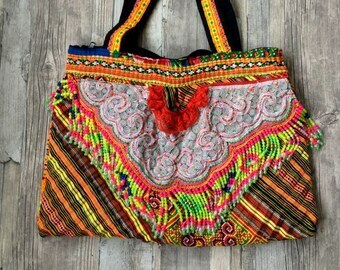 This form of embroidery is basically a local art form of the tribals or ‘Banjaras’ living in this state’s Telangana Region. The embroidery done by Kutch Banjaras and Gujarat Banjaras is slightly different. This embroidery is unique in its style and a matchless quality has been achieved by using brightness and originality. The intricate embroidery done as part of this art form involves a lot of geometrical combinations using squares, diamonds and triangles. 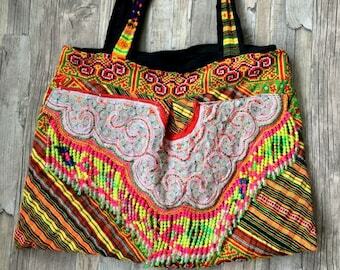 Colorful threads are used in the embroidery that reflects the vibrant life style of Banjaras. Their imagination knows no bounds and they just need a needle, a piece of cloth and some colorful thread. 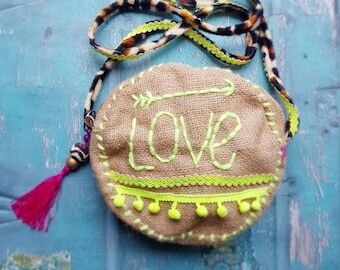 To embellish an article, they also make use of shells, beads and mirrors. The sunlight reflected through the mirror accentuates the beauty of this work. Mirrors are extensively used in Banjara Embroidery and this is the distinctive feature of this art form. A cornucopia of designs and figures are created using simple stitches like herringbone, chain stitch, short and long stitch. 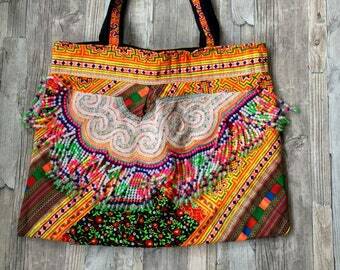 A wide array of articles are made using this embroidery like bags, dress sets for women and girls, cushion covers, skirts, blouse pieces, kurtas, household furnishings and bedspreads. Originated from North India, a popular tribe Banjaras moved to the Deccan Plateau deep in south during 17th century as baggage train carters in the reign of Aurangzeb, a prominent Mughal Emperor. Working as carters was the traditional profession of these Banjaras that they had to leave as 19th century saw the building and development of British Railways. They are now spread over the Deccan Plateau, living in small villages referred to as “tandas”. Today, they work as casual laborers. Fine clothes and tribal jewellery makes the Banjara women look more beautiful. Even while occupied with hard labour, they wear their jewellery in all its finery. They work in the road construction sites, breaking stones. 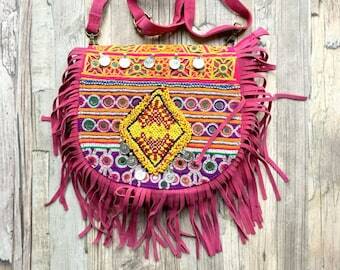 Banjara Embroidery is known for its vibrancy in colors and use of articles like coins, cowrie shells, woolen tassles, beads, mirror, cotton and many others as embellishments. The textiles embroidered by them simply look stunning. Andhra Pradesh women wear gorgeous cholis, ghaghras and odnis with bold mirror and appliqué work. In adjoining states, the similar embroidery work is done in a more subtle manner and the use of embellishments is slightly less than Andhra Pradesh. Beautiful square and rectangle work embroidered using stem and cross stitches is carried out in Maharashtra and Nimar and Malwa districts in Madhya Pradesh. They also use herring bone stitch closely together among a grid. Angularly zoomorphic or geometric designs are created on the textiles. 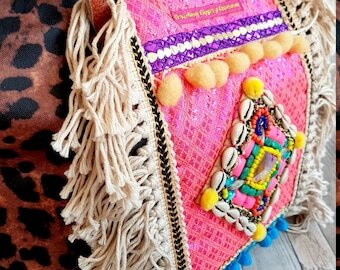 Tassled rumals are mostly embroidered that are then edged with mirrors or cowries. Other articles are batua or purse, women clothes like odhnis, cholis and ghaghras. The embroidery is majorly done of a blue or a brown colored cloth that are quilted. 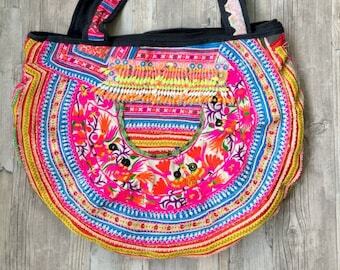 This way, the color contrast is easily decipherable and moreover, the embroidery comes out beautifully. Sometimes quilting stitches are used in patterning in which cotton threads are used to create unusual geometric patterns. Sometimes cotton or woolen thread is used to create intricate embroidery. 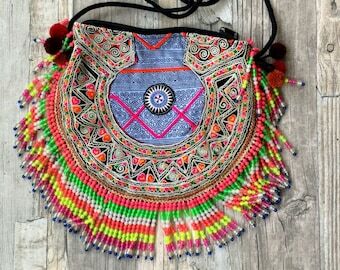 Besides purses, bags and clothes, a head ring is also embroidered using unique stitches. This is also known as “indhoni” and a woman keeps it on her hand to balance a water pot on her head.